3for5 Blog: 3for5 at TEDxDetroit! 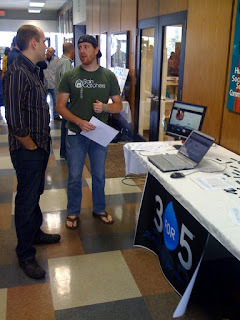 David and Anthony were very fortunate to have the opportunity to attend and exhibit on behalf of 3for5 at the first TED conference held in Detroit on October 21st! TED is a small non-profit devoted to "Ideas Worth Spreading." It started out in 1984 as a conference bringing together people from three worlds: Technology, Entertainment, Design. It has since become a global movement! There's tons of great video from TED's throughout the years at: http://www.ted.com. The TEDxDetroit event was truly awesome and was organized in large part by Charlie Wollborg at Curve Detroit. Everyone was very excited about 3for5 and we're happy that so many TED attendants took an interest in the 3for5 Movement for clean water. The next TED Michigan event will be somewhere on the Western part of the state (we're guessing Ann Arbor) so stay tuned!